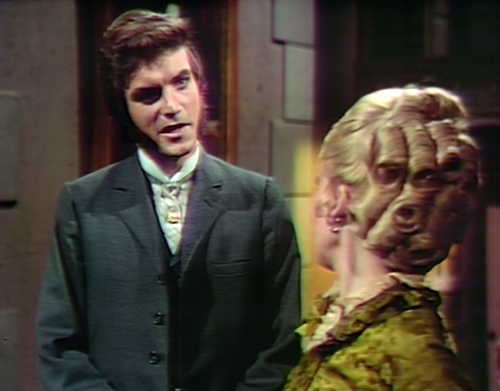 Of course, when I say that Dark Shadows is the same as other things, what I really mean is that it’s not like anything at all. I don’t think it’s even very much like itself these days. This is a logical contradiction that I am perfectly comfortable living with. At this point, the 1897 storyline has basically become a series of jazz riffs, where things happen because those happen to be the things that happen to happen. They use whatever actors showed up on the set today, and send them spinning through scenes that seem to make sense as individual conversations, but don’t actually connect to anything else that’s happened so far. For example: Mad god Count Andreas Petofi, seen here in the guise and garb of Quentin Collins, has discovered that despicable lawyer Evan Hanley teamed up with the real Quentin to reswap their bodies using candles and shouting. That part makes sense, don’t worry about that part. 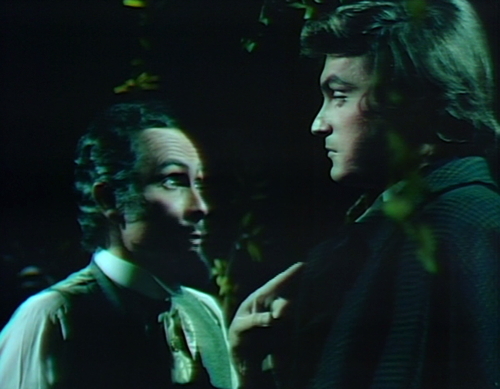 The weird thing is that when Petofi took control of the situation again, he sent Evan out to the woods and forced him to dig one of those perfectly rectangular holes in the ground that people on Dark Shadows all seem able to dig single-handedly, without the use of a ruler. Now that’s done, Petofi announces that he’s going to use the hole to bury Evan alive. This is a silly idea, because what are you gonna do, ask the guy to lie on his back and hold still, while you monkey around with a shovel for forty-five minutes? It’s just not practical. Nobody in that situation is going to get anything but dirty. So Evan pleads with Petofi for his life, which he could have been doing this whole time instead of creating this freestyle golf hazard. And he gets out of it by pledging to be Petofi’s servant, just like everybody else does. I can’t remember how many servants Petofi has anymore; human resources must be going out of their minds. Petofi tells Evan to look at the open grave, and vows, “If you bungle this, we shall meet right back here again. I promise that.” If that’s the case, they should probably hold onto their parking space; this is a bungling-heavy storyline. Then Petofi heads back to Collinwood for a tense conversation with his former self’s former fiancee. Angelique forced Quentin to propose to her a couple months ago, but she broke off the engagement last week, and now Petofi wants her to reconsider. This is a perfectly sensible storyline, and I only have three questions: Why did Angelique force Quentin to propose to her a couple months ago? Why did she break off the engagement last week? And why does Petofi want her to reconsider? To be fair, it seems like Petofi is just pretending to be interested in Angelique, because he’s suspicious of her and wants to find out what she’s up to. (By the way: she’s up to something.) It also seems like Angelique is being extra cautious around Petofi, although it seems like she hasn’t noticed that he’s Petofi yet. There’s a lot of “seems like” on the show right now. This is followed by an entertaining but baffling sequence featuring the entertaining but baffling Pansy Faye. She’s come to the art studio of Charles Delaware Tate, who’s supposed to be a famous painter but you could have fooled me. His last real connection to a storyline was his magical creation of Amanda Harris, who was involved in a twisted love triangle with Quentin and Tate. But then Amanda left the show abruptly so that the actress playing her could perform in London for a while, and now Quentin’s not Quentin anymore anyway, so Tate’s just kind of rattling around loose. They’ve sent Pansy over to have an entertaining scene with Tate, because she is an inherently entertaining character who’s never had a bad scene, although it’s difficult to tell what her storyline is supposed to be these days. She lives at Collinwood, she’s sort of romantically interested in Quentin, and that about wraps it up. But now she wants to buy the portrait of Amanda for some undisclosed reason, which Tate doesn’t want to sell. He tries to brush her off by telling her that the price is five thousand dollars, which she magically produces from her reticule. It’s not clear how she has all this money, in exactly the correct demination that Tate asks for on the spur of the moment, but it’s not clear why she wants the portrait of Amanda, either. It’s just one of those jazz riffs. 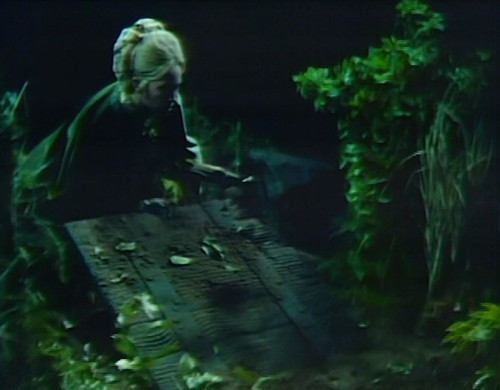 And here’s Angelique at Shipwreck Point, where there seems to be a trap door built into the world. I’m not sure how you’d go about creating a hatch like this, even if you had a shovel and a lawyer. On Lost, they make a big deal about the hatch; just the fact that it exists is enough of a mystery to take them through the whole first season. 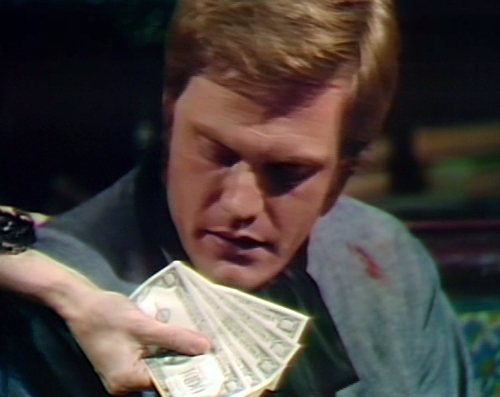 On Dark Shadows, this is a throwaway detail. And it turns out that when you go through that hatch, there’s a hidden cave down there, which means that somebody around here constructed a secret storm cellar. I don’t want to give away the big secret that probably everybody already knows, but there’s a thing that’s hidden in the netherlands under Shipwreck Point. That thing used to be hidden in the rectory, until Julia suddenly disappeared a couple weeks ago and couldn’t wave people away with a stethoscope anymore. That means Angelique has literally unearthed this vacant property with essentially no notice at all. Her real estate agent must be amazing. Petofi told Evan to follow Angelique through the woods, because lawyers are inherently stealthy. So Evan goes back to Collinwood to ask Petofi if he should investigate the hatch, and Petofi says yes, please do, so Evan goes back and does. And I guess that I should just go ahead and admit that I’m bored with 1897. It’s weird. Quentin, Angelique, Count Petofi and Pansy are some of the best characters on the show, but it feels like they’re just orbiting each other for no particular purpose right now. There are two scenes today where Pansy pokes fun at Angelique for the aborted engagement, which should make me happy, but those scenes don’t connect to anything else, and it’s all starting to get a bit samey. I think what’s at the bottom of this is that Jonathan Frid hasn’t come back from his month-long vacation in Illinois, and now Grayson Hall is gone too, off for a month to appear in a Michael Douglas movie called Adam at Six A.M. So maybe it turns out that David Selby and Lara Parker can’t carry the whole show on their own, a conclusion which has ominous implications for the future. But it’s not their fault, really; it’s just that the main storyline is put on hold while we’re waiting for Barnabas to get involved again. Count Petofi is supposed to be investigating I Ching hexagrams to figure out which is the time travel one, and Aristede should be out right now recruiting more test subjects, but instead, Petofi’s moping around the house, wondering what Angelique is up to, and we don’t even know what she’s up to, except that it takes place in a make-believe world where people build brick walls smack in the middle of a cave. That’s where Evan is now — down the rabbit hole, where there’s water reflecting onto cave walls thanks to some illumination source that we can’t see, and somehow there’s a brick wall behind him. This appears to be some kind of naturally-occurring comedy club. And then somebody sneaks up behind Evan, and knocks him out cold, which is just a textbook example of bungling. So I don’t know, this is all very mysterious and strange, but if Barnabas doesn’t reincarnate soon then I don’t know what I’m going to do. As long as we’re down the hatch, I’m going to give them another 108 minutes to pull this together, which at 22 minutes per episode puts us somewhere around next Wednesday. Tomorrow: Things People Say While They’re Waiting for Barnabas to Come Back from Vacation. The scene with Angelique and Pansy in the Collinwood foyer takes place in the morning, but when Pansy opens the front door, we can see that it’s dark outside. When Tate closes the door after Pansy’s entrance, the vibration makes a window treatment fall down with a crash. Tate turns to look at it, and then continues with the scene. When Angelique rushes out of the drawing room door to ask Petofi if she should come with him, you can see Pansy standing at the top of the stairs, waiting for her cue. In the last scene, when Petofi enters the house in a hurry, a camera is in the wrong position, and it pokes into the frame on the right. 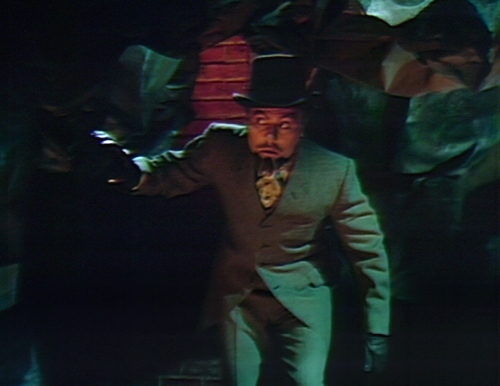 I’ve seen those “perfectly rectangular holes” outside of Dark Shadows, but I never really thought about it till the MST3K version of “The Thing That Couldn’t Die,” where the dimmest character in the movie manages to dig one, and of course there are a few jokes made about that. Are we sure Ronco hadn’t developed a Grave-O-Matic to produce those perfectly rectangular holes? 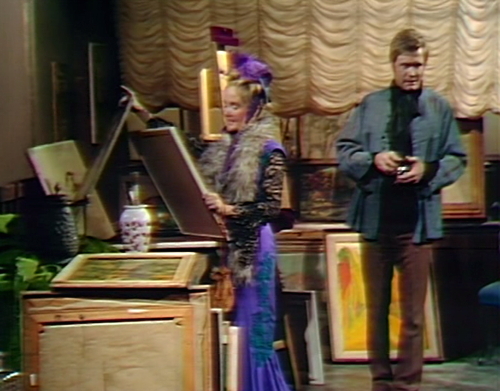 I would defend somewhat Selby and Parker’s ability to carry DARK SHADOWS. I agree that now (and 1970 PT) aren’t compelling examples but there was a period a few weeks ago where Selby as Quentin truly drove the show. Now the series is in a bit of a holding pattern, with two of its main stars absent, and the body swap storyline going longer than perhaps necessary. Much of this, I think, is due to the series clearly waiting around for Barnabas’s return. The irony is that he doesn’t really do that much when he does come back. No, no, no, I don’t want 1897 to end. I started watching back in 1969 while the show was in 1897 and I assumed that was where it was always set, and so I spent the next year wanting to go back to “my people.” Eventually I warmed up to the present-day characters. But when a commercial announced DS was going “back to the past” in 1970, I assumed they meant 1897 and I was so happy. The clues were there: Pansy Faye especially. I still think it would have been better to go back to 1897 instead of the dreary, cheesy, continuity-shattering 1840… maybe it would have been 1899 by then. As it turned out, Petofi could have been behind the 1970 haunting… he’s still trying to get to the future and into Quentin’s body. Grayson could have donned the Magda wig again and Selby could have resumed his place as a central mover on the show. Great idea!! Alas, if only we had some I-Ching wands…. Petofi uses Pansy for I Ching. The door she uses is 1970PT. She disappears. To the befuddlement of everyone, even herself. And together they once again get their own show in 1970 present because they were together in the PT room as it burned, then changed. 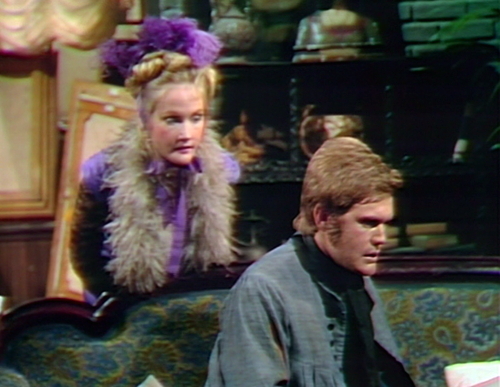 The Pansy And Angelique Show ran for 25 years after DS was cancelled in ’71. “This is a silly idea, because what are you gonna do, ask the guy to lie on his back and hold still, while you monkey around with a shovel for forty-five minutes?” I was under the impression, based on the previous episode, that Petofi/Quentin now had Evan under some sort of mind control, so Petofi certainly could have forced him to lie in the grave while he buried him alive. For those still playing along, It is disingenuous to ask where Pansy got the money for the painting as if it will never be explained. Sure, it is inexplicable now, but all will be explained – and much, much more will be explained – over the next week of episodes. thank you, TD and Miles, that’s twice now that you’ve come along and taken the words out of my mouth, before i could come along and say them, in my own belated time stream, letting me out of all that time travel bother.